The existence of the village is recorded in the Domesday Book. Before the dissolution of the monasteries under Henry VIII in the late 1530s, the land in the village was held by the abbot of the great monastery at Bury St Edmunds. The local lords of the manor were the dukes of Grafton in neighbouring Euston. The first Duke of Grafton, previously Earl of Euston, was Henry Fitzroy, the natural son of King Charles II by Countess of Castlemain. The third Duke of Grafton was briefly prime minister. The current Duke of Grafton is the 12th. This rural part of Suffolk proved to be an ideal location for the 1970s British TV show Dad's Army. In common with much of the surrounding area, Sapiston and Honington were used for part of the series, in particular the episode "Things That Go Bump in the Night". The outside of the village school appeared as the church hall used for the Home Guard drill hall in a number of episodes. The TV director, producer and writer David Croft, co-writer of Dad's Army, 'Allo 'Allo!, Are You Being Served?, Hi-de-Hi!, etc., lived at Honington Hall until his death at his Portuguese holiday home on 27 September 2011. The village's most famous past resident was the pastoral poet Robert Bloomfield, born in Honington in 1766. His first and most famous poem is "The Farmers Boy". Bloomfield is buried at Shefford in Bedfordshire, where he spent the latter part of his life. RAF Honington opened on 3 May 1937. "From Barren Rocks to Living Stones" records that Honington was able to play a part in accommodating British evacuees from the terrorism in Aden in 1967. This was a major British operation at the time. 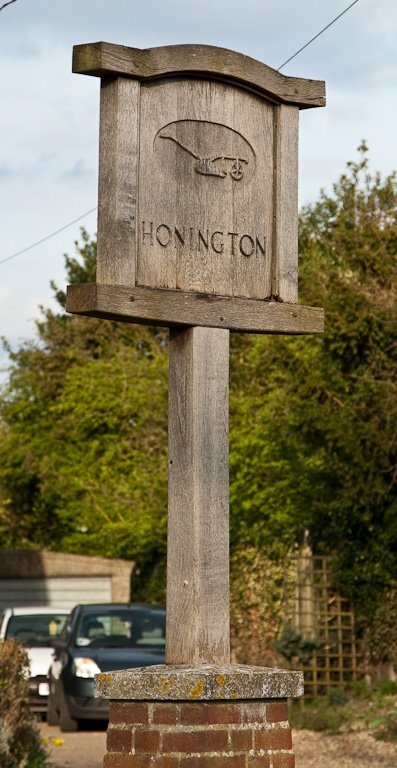 In 1994 flying operations stopped and the Honington Air Traffic Control Zone ceased to exist in preparation for Honington becoming the depot of the RAF Regiment. The station now sees only very occasional air traffic. On one occasion in recent years the runway and ground facilities were borrowed by the USAF for a short period while work was carried out on the runway at the nearby RAF Lakenheath.